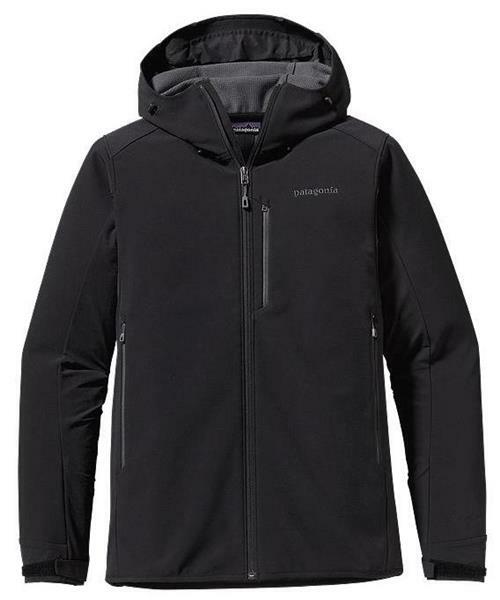 Wicked Wanda, Tuckerman Ravine, Longs Peak in winter: when climbing or skiing includes cold and wind, Patagonia's new soft shell Adze Hybrid Hoody resists moisture, breathes freely, and hoards your heat. The main body is comprised of a 3-layer Polartec ® Windbloc® stretch-woven polyester soft-shell fabric that repels wind and sheds snow, while its bonded fleece grid interior wicks moisture and adds light insulation. The hoody’s low-bulk construction also uses unlined, stretchy, double-weave soft-shell fabric in the side panels, cuffs, and along the underside of the arms to minimize bulk while enhancing breathability and mobility. The helmet-compatible hood adjusts for a custom fit; the zippered hand pockets sit high and clear of a harness, and the hybrid cuff design stretches over gloves and has a minimalist hook-and-look closure to secure the seal. With an exterior and interior zippered chest pocket, and a no-bunch drawcord hem. With a DWR (durable water repellent) finish.